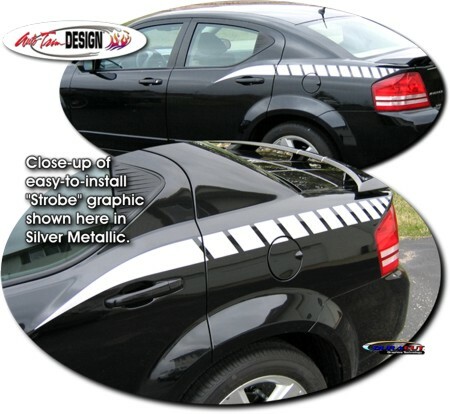 Trick out your '08-'14 Dodge Avenger with this retro style "Strobe" graphics kit. This easy-to-install kit is packaged as a set of two (2) pieces (one  for each side of the vehicle) that are contoured and fit for the rear door & quarter panel of the Avenger as shown. They're PRECUT and ready to install in a wide variety of colors (requires light trimming at door jamb and fuel door area)! This kit is specifically made for the '08-'14 Dodge Avenger and will not fit any other vehicle. Includes easy-to-follow general online instructions. Title: Good stripes, stay stuck. wish they would last longer. Comments: First have to say these decals stay stuck on the car with car washes etc. No complaints with anything other than durability. Wish they could be made from a better material to stand up to the sun like factory stripes. All that said I'm ordering a replacement set after 3 years on my Avenger.